A trademark is a recognizable sign, design, or expression which identifies products or services of a particular source from those of others, although trademarks used to identify services are usually called service marks. Service marks may also be called trademarks. The trademark owner can be an individual, business organization, or any legal entity. A trademark may be located on a package, a label, a voucher, or on the product itself. A trademark identifies the source of the goods or services, i.e., the owner. The owner may license the trademark to another for use in the manufacturing or sale of goods or services. Conversely, the manufacturer may obtain a license from another person or entity to use a trademark in their manufacturing of goods or services. The United States Patent and Trademark office has the right to deny trademark registration if person or entity affixes the ® symbol to a trademark if there is no actual registration. A trademark is usually a word, phrase (such as a slogan), logo, symbol, design, image, or any combination of these elements. Colors, smells (such as perfumes) or sounds may also be trademarks. Trademarks are classified as generic, descriptive, suggestive, arbitrary and fanciful. There is no protection for a generic mark which is actually the good itself. For example, the mark APPLE representing the goods apples is just a generic term for the good itself. A descriptive mark describes some particular quality or aspect of the good. For example, DELICIOUS for applies describes a quality. There is limited protection for descriptive marks although a Supplemental Register registration may be available which accords certain limited rights like the right to use the ® notice symbol along with the mark. Suggestive marks suggest some aspect of the good or service but it takes a leap of imagination to connect the mark with the good or service. For example, CATERPILLAR is a suggestive mark for earth moving equipment. An arbitrary mark is an ordinary word but applied to an unrelated good or service. For example, APPLE representing computers and software is an arbitrary mark. Fanciful marks comprise terms that have ben invented for the sole purpose of functioning as a trademark or service mark. For example KODAK represents film and XEROX represents photocopy machines. All the world’s goods and services are broken down into trademark classes. There are approximately fifty classes. Classes 1 though 34 cover goods; Classes 35 through 45 cover services. Classes A and B cover certification marks and class 200 covers collective membership marks, e.g., a fraternity or sorority. There are many, many other aspects to trademark law—too numerous and complex to explain within this website. 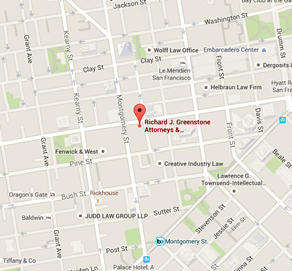 Richard J. Greenstone, Attorneys & Counselors at Law have handled well in excess of five hundred applications and many infringement matters. The firm brings its unique experience in language, semantics, art, and branding to advising clients and other attorneys on matters involving trademarks. We invite you to contact us about your trademark requirements.